Please email MemberServices@invino.com for any questions you might have regarding shipping. ​When it’s hotter outside we want to make sure your wine arrives safely. For years we have provided best in class summer shipping options. We are offering refrigerated shipping to our forward warehouse in Ohio at no additional cost to you. Trucks leave every Tuesday and Friday for the Ohio warehouse. Tuesday trucks first delivery is the following Monday, and Friday trucks first delivery is the following Tuesday. First delivery attempts are based on distance from the Ohio facility. Please note that we do not ship on Thursday or Friday so that the packages don’t sit in the warehouse over the weekend. The best news for you is that we will monitor the weather for you and automatically choose the best option for your area as the default. You can always choose any method you would like, including regular ground or consolidated orders, however if you choose an alternate option that provides no protection, our palate guarantee is void. Zone skip – Refrigerated trucks depart our Nor Cal warhouse on Tues and Friday and arrive in market the next week for 1-2 day delivery times in most markets. No additional cost. Special Packaging add on option – Orders are packed and shipped from our Nor Cal or Ohio warehouse (combined with zone skip) with special packaging and ice packs and are shipped to minimize time in transit over the weekend. 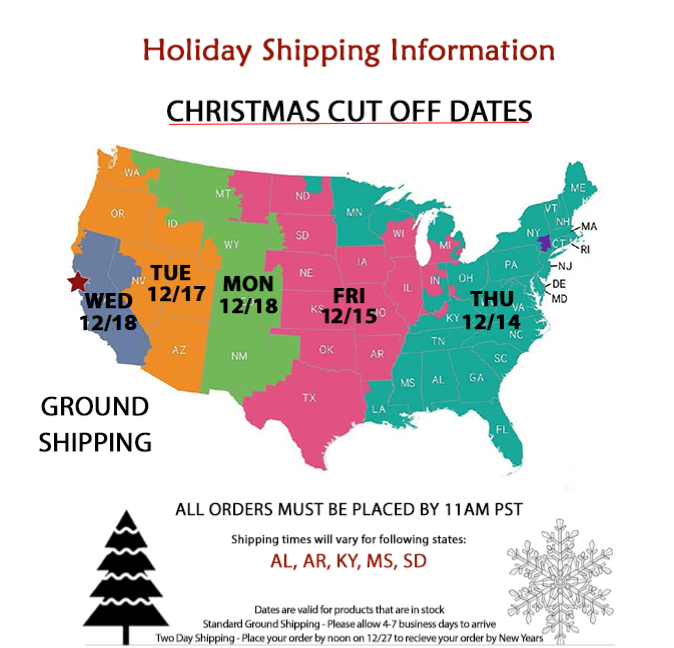 For example, an order shipped that is a 2 day move from CA (all the areas in brown in the below map) to the destination would only ship on Monday, Tuesday and Wednesday. The relevant service levels in your area will be available in the shipping pull down menu. Please also note: DURING SUMMER SHIPPING, IT IS ESSENTIAL THAT SOMEONE OVER THE AGE OF 21 IS ABLE TO SIGN FOR THE SHIPMENT ON THE FIRST ATTEMPT OF DELIVERY. INVINO BEARS NO RESPONSIBILITY FOR THE CONDITION OF THE SHIPMENT IF THE FIRST DELIVERY ATTEMPT IS NOT MADE. WE STRONGLY RECOMMEND SHIPPING TO A BUSINESS ADDRESS TO ENSURE SAFE DELIVERY. The Member is solely responsible for importation of their wine into the jurisdiction of their shipping address and promises and agrees to indemnify, defend and hold invino harmless from and against any and all claims, liabilities, and expenses (including taxes, interest, penalties, and attorney fees and amounts paid in investigation, defending or settling any of the foregoing) arising out of or in connection with: (a) any act by or omission of Member, their agents or employees, or allegations made upon such acts or omissions, relating to or affecting the wine sold to and shipped on behalf of the Member by invino in accordance with these Terms and Conditions; (b) any inaccuracy of any representation made by Member in connection with the transactions contemplated by these Terms and Conditions; (c) any claims brought or asserted by any third party against Member for any wine sold by invino to the Member and shipped in accordance with the Member's instructions and per these Terms and Conditions. invino makes no representation as to the rights of anyone to import wine into any state outside of California. Member authorizes invino to act according to Member's instructions to engage a common carrier to ship Member wine to destination zip codes where invino is willing to make such arrangements or to deliver Member wine to a third party shipper hired and instructed directly by the Member. For more information on shipping alternatives, please contact us at MemberServices@invino.com. We may be able to assist in engaging third party shipping providers into states that we do not ship to. We are unable to ship to P.O. boxes. An adult, 21 years or older, must be present to sign for each shipment; our shipping partners do require proper identification. This person may be an adult besides yourself, but they must be 21 or older with an acceptable form of ID present at time of delivery. Our shipping partners will not deliver to adults who are visibly intoxicated at the time of delivery in accordance with Federal law. To avoid unnecessary delays and complications during transit and delivery, we suggest that you use your business address, or make arrangements for an adult to be present at the delivery location. If after several delivery attempts the shipper returns the package to the warehouse, the Member will be responsible for the total shipping fees (this may be the actual cost if the shipping was subsidized). Should this occur, we will contact you and you can either cancel the order and receive a refund for your order less the total shipping fees, or pay for a second shipment. If you have placed an order and are unable to have an adult present at the time of delivery, please call 800-518-2127 or 707-202-5507 to speak with a representative. In some cases we may be able to change the shipping address if the order is not in the final stages of fulfillment. Due to various state laws, some retailers are restricted from shipping wine directly to some states. With state laws ever-changing, we recommend checking back frequently to check with us for states shipping status. We currently do not ship outside of the U.S., to U.S. territories such as Puerto Rico, or to Military and A.P.O. addresses. Check out FreeTheGrapes.org to learn more about unfair state shipping regulations and what you can do if your state doesn't accept direct shipping from America's wine producers and retailers. Connecticut: State regulations prohibit wine and food from being shipped in the same package. Gifts & Baskets ordered that include both food and wine will be sent in two separate packages. New York: State regulations prohibit wine and food from being shipped in the same package. Gifts & Baskets ordered that include both food and wine will be sent in two separate packages. Texas: State law prohibits us from shipping wines containing more than 16% alcohol. Orders are shipped using ground service unless upgraded by the Member. Order processing time is contingent upon credit card authorization, and does not include weekends or holidays. If you are dissatisfied in any way with your purchase, please contact us within 30 days of your purchase date via email at MemberServices@invino.com; we would like the opportunity to correct the situation. Following wine-trade traditions, all bottles seven years or older are purchased at the buyer's risk. The member is responsible for having an adult available to accept the shipment. All common carriers (FedEx and UPS) require an adult signature to accept the wines no exceptions. Each carrier will make three attempts to deliver the wine and it is the responsibility of the Member to make alternate arrangements if necessary. Each carrier allows for a multitude of ways for you to get your wine, if you have any questions about your options, please contact us at MemberServices@invino.com. All wine returned to invino because of non deliverability will be credited back to the Member as Insider Credits minus the actual cost of shipping and handling. We strongly recommend you send your wine to a business address where an adult will be available to sign during business hours. We are sorry we cannot make exceptions to this policy. You can always place your order on hold with us for an unlimited amount of, time free of charge. We will be happy to ship your wine for you when convenient. All returns are for Insider Credits only and will be processed less the original shipping and handling charges, and return shipping and handling charges. Subject to inventory availability, orders placed before 1 PM PST will be processed and shipped the same day. Orders placed after 1 PM PST are shipped the next day. During cold or warm weather shipping months, wine delivery may be delayed by a few days to a week or more to ensure safe delivery. Residents of: AL, AR, KY, MS, NH, PA, due to strict direct shipping laws in your state and the need to clear all transactions through a third party, orders may face additional delays. Our third party distribution partner picks up from our warehouse one day per week, so ship times will be extended anywhere from an additional two days to two weeks. Shipping fees are calculated based on the weight and number of bottles purchased at one time to one address. We offer $20.00 ground shipping per 12-bottle caseon all purchases. The flat rate case shipment will be applied to every 1-12 bottles being shipped. There may be a state handling fee added to the order for delivery to certain states. This is imposed by the carrier. As wine lovers ourselves, we are frustrated by online wine retailers who complete wine orders, later to find out the wine is not available. To ensure this doesn't happen, we set specific wine levels before an event begins with 'Sold Out' at the point where there's no inventory remaining. Of course, human error may find its way in to the mix on occasion; should your wine be out of stock any payment will be refunded and you will be notified immediately of the out of stock. Your satisfaction is very important to us. We are committed to delivering your product in excellent condition and in a timely manner. If you are dissatisfied in any way with your purchase, please contact us within 30 days of your purchase date; we would like the opportunity to correct the situation. Following wine-trade traditions, all bottles seven years or older are purchased at the buyer's risk. When your order is en route, the carrier will send an email to your invino account's email address to inform you the estimated date of arrival for your wine. *Please note: Many shippers send an automated shipping notification immediately after the order is processed; this gives an inaccurate date of arrival. Please wait until your shipment is en route before acting based on the carrier's estimated arrival date. Shipping wine can be a complicated and pricey endeavor, so the invino shipping department subsidizes shipping costs to deliver the best shipping price for our Members. That means that for all orders, we offer a flat rate of $20.00 for ground shipping per 12-bottle case on all purchases. An added handling fee may apply in certain states and is a fee based on that states regulatory structure. *Note: during the warm weather months, special packaging shipping options are highly recommended (but not required), which call for an added fee. Unfortunately, at this time we're unable to ship outside the United States. Simply select your shipping option of choice at checkout, including 3 Day Select and Next Day Air. Please note that normal processing time of 2-4 business days as described above still applies. Simply use the calendar feature to specify the date you'd like your wine to ship, and we will store the wine in our temperature controlled facility until your chosen ship date. Unfortunately, we cannot ship to a P.O. Box because of the alcohol regulations, someone 21 years or older must be available to sign for the shipment. OFFICE IS LOCATED IN THE THIRD BUILDING, THE FIRST DOOR ON THE LEFT. Send us your queston to memberservices@invino.com. It is unusual to receive a damaged product from invino. However, in the event you do experience a problem with a shipment, please contact us within 30 days of your purchase date. At our discretion we may offer a replacement, a discount, a refund or an account credit to be used for a later purchase.